……but you like one style of garden design, your partner likes another! When you are selecting your designer it is helpful if you have seen some evidence that they have designed the sort of project that you have in your mind for your place. Look for evidence in their work – their websites are usually the best place for this. Look through their portfolio on their website – is the sort of work they do or tend to specialise in the type of look you are after? Every designer has different preferences. Some may create mainly casual, informal gardens, some may seem to do a lot of contemporary, clean-lined gardens with minimal planting. If the designer seems to specialise in, say, strictly modernistic or minimalist gardens then the idea of doing a cute meandering cottage garden would make them weak at the knees! It is so important to choose someone that’s on the same wavelength or you will be struggling throughout the process to make yourself understood. After checking out their work (usually on-line but also through magazines, books or simply through friends who may have used this designer) the suitability of the designer will be confirmed in the first meeting. There’s nothing like a face-to-face meeting to sort out their suitability or otherwise! It is really hard sometimes as a designer to get the ideas from a client and run with it to show them, yes you are on the same page at the same time. It is tricky for a designer as you can’t just be a yes person because if someone comes and says I want to put this big thing here and I want to do that and I want to build this thing up here and I want to stick this out there and you just think it is wrong, you have got to tell them. If they don’t like where you are coming from then you just have to walk away. I quite often do that and half the time I lose the job and half the time usually the wife is jumping up and down cheering on my behalf in the background. The husband has got some idea of what he wants to do and the wife is thinking crikey that’s a disaster so she has got me in under duress from the husband and I have said Oh my goodness what do you think you are doing, you are mad that’s just nuts and the wives going yes yes. It is really funny. There must be a balance between your clients taste and your expertise. I have to be flexible and that is one thing I have as a designer which some designers choose not to have. Very valid. For example some architects have a style and if you want that style you go to that architect. There are a couple of architects in Wellington that I adore that only do one style and if you want that style you go to them and if you don’t, don’t go to them. If you want something else don’t go to them they won’t do it. I mean they might take the job but they are not going to like doing it. Landscape designers have to be a bit more flexible than that. Having said that some landscape designers have a style and there is nothing wrong with that it is a totally valid way of operating. You say I’m sorry this is all I do. One of my friends in Auckland is a landscape designer and she only does clean ,modern ,rural gardens she doesn’t do anything else. If someone comes to her and says I want a causal woodland garden, she says nope won’t touch it, that’s not what I do and that is fine she has enough clients to do that and that’s what she loves doing. That is what I love about my job, every job is different and every client is a little bit different and yes you can put them in one category or another but basically the variety is fabulous and it keeps me fresh, it keeps me designing with interest and excitement for each job rather than oh not another one of these. I think you can get stuck in a bit of a rut by designing the same thing all the time. As an owner do you have to have a really clear idea of what you want if you want to deal with a specialist? Yes you have to guide the landscape architect. They need to have a clear picture of what they think they want so that they can clearly explain that to me with pictures and words but definitely pictures because words can be different. Someones idea of formal is not someone else’s idea of formal. So yes that is really important that you get that sorted before you even get on the phone to talk to your designer. Well anyone could say right tomorrow I will be a landscape designer and put it out there and away you go. Normally a landscape designer is unqualified or they are minimally qualified with a certificate or something from anywhere. 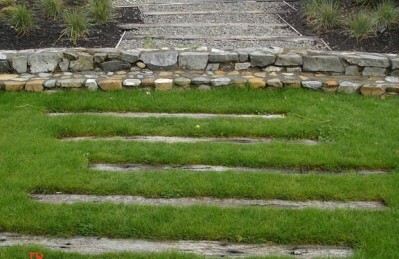 A landscape architect has to have gone to University and done a Bachelor of Landscape Architecture. I am a landscape architect and have sat the postgraduate exams which it a bit like being a lawyer and then being admitted to the bar. If you are going to be registered you have to keep up your professional development. I go to conferences there are wonderful bi annual conferences in Auckland and Melbourne, I go to those. They have speakers from all around the world.